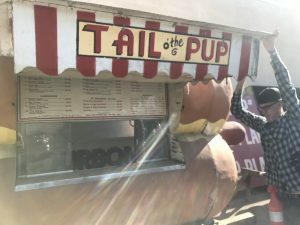 Tail o' the Pup Has New Owners and Is Reopening in L.A.
Home L.A. History Tail o’ the Pup Has New Owners and Is Reopening in L.A.
For 60 years, the Tail o’ the Pup served hot dogs to locals and tourists enchanted by its unusual architecture, colorful owner, and snappy frankfurters. The 17-foot-long hot-dog-shaped stand has been in storage for more than a decade, but the 1933 Group just announced that it has acquired the landmark and plans to bring it back as a restaurant in the near future. Bobby Green and his longtime partners Dimitri Komarov and Dmitry Liberman have a collection of highly thematic bars and restaurants including a restored 1920s bowling alley in Highland Park and Idle Hour, a programmatic structure shaped like a giant barrel in North Hollywood. When the original pup lost its lease in 2005, the stand went into storage and Alison Martino started to chase it down. Martino, who runs Vintage Los Angeles, found the giant stucco hot dog in a Torrance warehouse and worked with the family of founder Eddie Blake to encourage its return. A years-long effort to bring ‘the pup’ back to locations in West Hollywood, West L.A., Santa Monica, and Beverly Hills fizzled. Even Rick Caruso was interested in resurrecting it at the Grove, but nothing worked out. 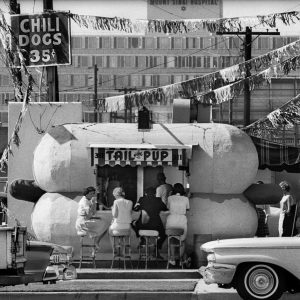 Tail o’ the Pup in its original location circa 1963. 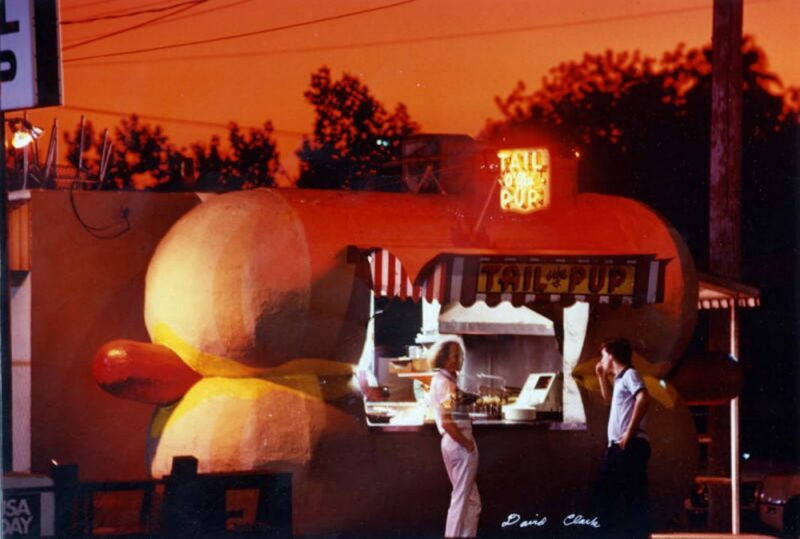 Eddie Blake and his son Dennis bought the larger-than-life hot dog in 1976 from the famous dance team Veloz and Yolanda, who’d commissioned the design from architect Milton Black 30 years earlier. The most famous examples of this type of architecture include the hat-shaped Brown Derby and Randy’s Donuts, but it wasn’t unusual to spot roadside eateries in the shape of chili bowls, coffee pots, and even a big bulldog around Los Angeles. The Pup was shorthand for L.A. in movies and TV shows, and including Columbo, The Rockford Files, and Adam-12. A replica of it was flown over the city in the opening sequence of Steve Martin’s L.A. Story. It was also a popular location for celebrities to be photographed throughout the 1980s. The stand was showing its age when it closed in 2006 after another property dispute. Dennis passed away in 2013 and his father, Eddie, died in 2017. Dennis’s last appearance with the Pup was with Martino on Eye on L.A. in 2013. She also captured him in a short documentary later that year, when the Pup was on its way to be restored in Las Vegas. Eddie’s grandson Jay Miller and his wife Nicole inherited the Pup and kept pursuing plans to reopen. They reached an agreement with Kevin Michaels and Brett Dougherty of Killer Shrimp. In a 2015 interview Dougherty revealed plans to reinstate the pup back on La Cienega with a replica at the Bloc in downtown L.A. They eventually applied the brand to a short-lived food truck on La Cienega. Killer Shrimp parted ways with the original owners and the building was donated to the Valley Relics Museum in Chatsworth. “The façade needed a lot of work,” says Tommy Gelinas, owner and operator of the Valley Relics Museum. “I was just honored to have it in my possession to keep it safe.” A crane lowered it to Gelinas’s storage and it remained there until a deal was made between the Blake family and 1933 Group, who purchased the rights to the name and promised to restore the original stand to the way it looked decades ago. Even the original neon sign came out of storage to join the Pup. Valley Relics museum founder Tommy Gelinas moves the Pup into place. The new owners have put out a call to action to find a new home for the landmark. They need your help to “Place the Pup” in a stationary, street-facing spot somewhere near its original location, in the West Hollywood or Hollywood area. They expect the input and support from locals to be among the first signs that the 1933 Group’s—and the Blake’s—dream of a new Tail o’ the Pup is on its way to being fulfilled.